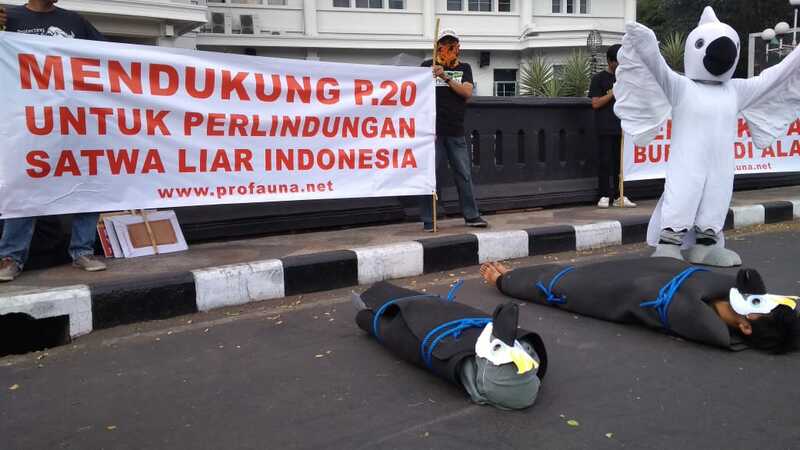 Protection of Forest & Fauna (PROFAUNA) Indonesia staged a public campaign to celebrate the Indonesian Parrot Day in Malang, East Java, on Friday (14/9) morning. On the campaign, PROFAUNA's activists demonstrated vicious bird smuggling practice. 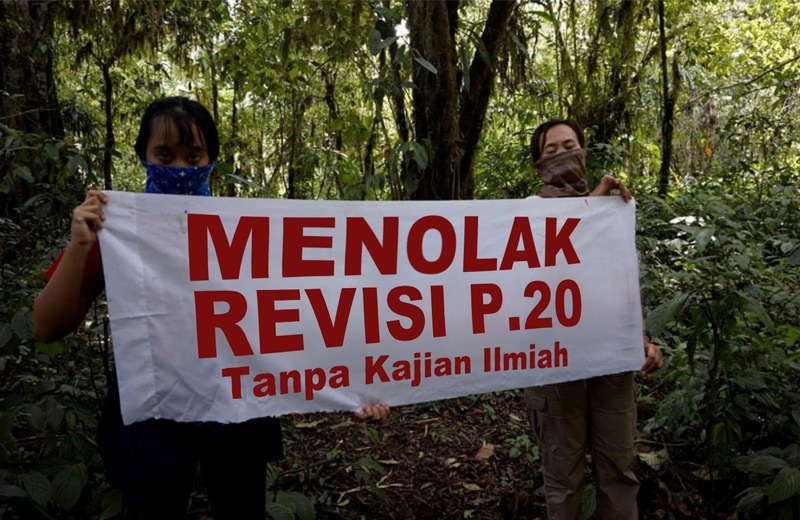 The demonstration was also held to express PROFAUNA's support for Environment and Forestry Minister's Decree no.20 of 2018 (P.20). P.20 containst a list of 921 protected widlife (plant and animal) species, serves as an amendment for the Government Regulation no.7 of 1999. Parrots make up a great part of the list, with 88 species in total. PROFAUNA Indonesia appreciates and fully supports the newly issued regulation as formerly unprotected species, such as the White Cockatoo (Cacatua alba), can now be conserved under a firm law which strongly forbids their trade and capture. "Now that we have a legal basis, we can enforce firmer law against parrot poaching, trade, and ownership," said Afrizal Abdi, PROFAUNA's Campaign Officer. Law no.5 of 1990 Concerning the Conservation of Living Natural Resource and Its Ecosystem states that anyone charged with poaching, trade, and illegal ownership of protected wildlife species faces up to 5 years in prison and IDR 1 million fine. Ironically, 2 months after P.20 was issued, the government motioned to amend the list of protected wildlife species which is by revoking protection status of three birds: White-rumped Shama (Copsychus malabaricus), Straw-headed Bulbul (Pycnonotus zeylanicus), and Javan Pied Starling (Gracupica jalla). The motion was made, quite ludicrously, after the government received protests from songbird fans and people within bird trade busines. "This is a major setback, not mentioning its massive threat to wildlife conservation because there is an alarming possibility of such revocation for other species in the future, including parrots," Afrizal warned. The amendment should be based on scientific data, instead of pressure from certain groups. PROFAUNA also sees that songbird fans are overreacting, considering the new law strictly prohibits capture from the wild while still allowing regulated captive breeding. PROFAUNA staged the Indonesian Parrot Day, which falls every 16 September, to raise public awareness toward parrot conservation. Today, parrots' biggest threat comes from illegal trade. Recently (4 september 2018) the Police of Indragiri Hilir, Riau, thwarted a smuggling attempt of 38 cockatoos destined for Singapore. The birds worth approximately IDR 380 million, and were going to be shipped through Batam, Riau islands. Among the species were the Palm Cokcatoo (Probosciger atterimus), White Cockatoo (Cacatua alba), Salmon-crested Cockatoo (Cacatua moluccensis), and Sulphur-crested Cockatoo (Cacatua galerita). "The easiest thing we can do to help protecting parrots are to not buy and keep parrots, because 95% of the traded parrots were captured from the wild. If this continues, they will go extinct rapidly," added Afrizal. PROFAUNA's latest investigation on November 2016 revealed that parrot poaching and trade rate is still high,around 3,000 White Cockatoos, Chattering Lory, and Eclectus Parrots are captured from their natural habitat during the fruit season.